CelebriTV will premiere tomorrow afternoon on GMA 7. ASIDE FROMIlustrado’s rerun on GMA News TV this Monday, another litany of desperate strategy comes from the main channel in Timog Avenue that will premiere tomorrow. CelebriTV is said to be the weekly “trend-tertainment news” and “comedy talk show” replacing the nearly two-decade-old Startalk (with 1,024 episodes). The end of Startalk was mainly due to the shift of preference of providing local entertainment news online rather than on television. Apparently, long time comedian Philip Lazaro will be the show’s director, so kaya may comedy factor ang celebrity by hiring Lazaro. I hope so too. Mukhang may halo ring format ng mga late-night talk show ang CelebriTV, but let’s find out bukas kung ano talaga sila. It’s now a battle between a serious show in which more viewers are getting more involved on issues that matter the most and a comedy celebrity talk show in which we don’t know the format as of yet. People might watch this show out of curiosity tomorrow, and GMA should realize the changing trends with most people getting tired of weekly celebrity talk shows in favor of daily celebrity talk shows (e.g. Aquino & Abunda Tonight; soon to be known as Tonight With Boy Abunda and Showbiz Konek na Konek), as well as online celebrity websites. Let’s see if they still have a taste for such programs. 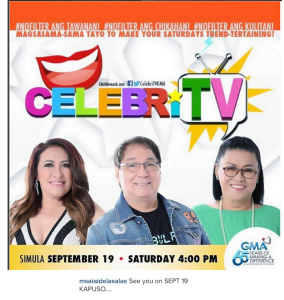 Besides, this show will be not aired live (according to Lolit Solis’ article on PSN) unlike Startalk which had been aired live for many years. That said, I won’t be surprised if they end up as an afternoon version of a late night talk show sans a studio audience. Napansin ko nga nagiging game show na ang format ng CelebriTV ngayon ay nalalapit na ang pagtatapos ng show (the show will end on May 21), nawala na kasi ang mga showbiz news. The internet is now the source for anything showbiz. That is the reason why nawala na ang The Buzz at Startalk because of the internet. And GMA harshly realized it. At this point, mahihirapan na silang magkaroon ng pamalit na programa; they can’t even get a program that would compete with Marc Logan. Yung Sabado-Badoo na dapat sana’y karibal ng Mga Kwento ni Marc Logan, iilang episodes lang ang inere. Perhaps their only choices now is to either extend the running time of Karelasyon and Wish Ko Lang, or add a movie block, just to compensate for the eventual loss of CelebriTV. Neither is a good idea though. Either CelebriTV is desperate or just jealous of how Celebrity Playtime and Family Feud were getting high ratings. Either way, the end is near. Looks like GMA just realized na tapos na ang celebrity talk show era since we have internet for the latest entertainment news. Mukhang Tonight With Boy Abunda na lang ang tanging program na dedicated sa celebrity news, albeit on a daily basis. They should’ve done this a long time ago, after matapos ang Startalk. Kaso they put too much faith on CelebriTV, kaya ayun ang nangyari. Until now, they’re smarting from this act.